Spell Snare ($0.98) Price History from major stores - Dissension - MTGPrice.com Values for Ebay, Amazon and hobby stores! Card Text: Counter target spell with converted mana cost 2. 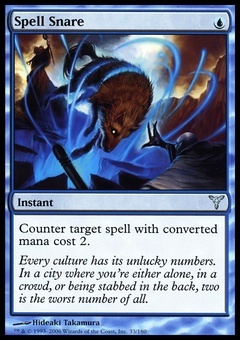 Flavor Text: Every culture has its unlucky numbers. In a city where you're either alone, in a crowd, or being stabbed in the back, two is the worst number of all.